Commercial Tire Service is locally owned and operated. We pride ourselves on personalized service and honest pricing. 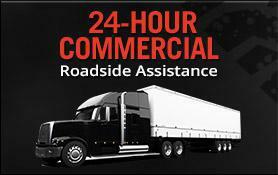 We offer 24-hour commercial tire service. We've recently expanded into light mechanical maintenance. We proudly service Western Colorado and Eastern Utah. We offer commercial, light truck, passenger car and SUV tires from Michelin®, BFGoodrich®, Uniroyal®, Goodyear, agricultural tires from Titan, Firestone, BKT and many other brands. As a locally owned and operated tire shop we're able to offer personal service and many years of experience. We've been at our current location in Grand Junction for over 10 years. Our team has over 75 years combined experience, and that makes a difference! Commercial Tire Service has custom wheels from all the major manufacturers. Give your vehicle a new look with great rims from American Racing, KMC, Method, Fuel and many more. Looking for Racing Tires? We are a BFGoodrich Race tire dealer. Contact us today for the best tires for your vehicle. Attention semi truck drivers: Did you know that we offer custom wheels for your semi? Be one of the first to show some style with different color and finish options in custom wheels in sizes 22.5 and 24.5 inch wheels.